Langston Hughes' poem Dream Deferred is the source of the title of short-lived but influential playwright Lorraine Hansberry's classic play A Raisin in the Sun. She died at the age of 34 just six years after the play opened on Broadway in 1959, but her work still resonates today. The story of a black family's struggle in 1950s Chicago to accomplish their dreams in a world that didn't want to let them can be palpably felt in the context of today's world. It's a great choice, then, for Park Square Theatre's 2016-2017 season and for their student matinee program, which serves over 30,000 students every year. And it's an incredibly moving production that brings out all the richness of Hansberry's writing. The fantastic local cast and the intimacy of the Andy Boss thrust stage making you feel as if you're in the Younger living room with them, experiencing this devastating, life-changing, and hope-inspiring event. 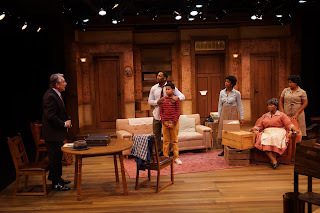 The entire play takes place in the living room of the Younger family in a shabby but well cared for apartment on Chicago's South Side (represented in great detail and realism by Lance Brockman's scenic design). Matriarch Lena (the divine Greta Oglesby) lives there with her two adult children, after raising them there with her deceased husband Walter. The family includes brother Walter Lee (a fantastic Darius Dotch), his wife Ruth (the always wonderful Aimee K. Bryant) and their son Travis (the adorable Andre G. Miles), and sister Beneatha (an appealing Am'Ber Montgomery). They all have dreams, and the arrival of an insurance check worth $10,000 (approximately $83,000 in today's money) has them all wanting to make their dreams come true, if they can only agree on whose dream to pursue. Lena wants her family to have a house they can call their own, with a garden where she can grow a plant or two, and a yard where Travis can play. Walter Lee wants to buy a liquor store so he can be his own boss and support his family. Beneatha wants to be a doctor (pretty impressive dreams for a young black woman in the '50s), and is torn between two suitors (Cage Sebastian Pierre and Theo Langason). This is a family that loves each other deeply; they all want what's best for the family, but can't agree on what that is. Further complications arise, including an unexpected pregnancy, a betrayal by a business partner, and most shockingly, the arrival of a white man from the "neighborhood improvement society" (Robert Gardner) who wants to buy them out to prevent a black family from moving into the all-white neighborhood. How each family member reacts to these complications determines what kind of person they want to be and the future they will have. Conflicts in the play arise firstly from a generational divide. Lena tells her son that her generation was most concerned with not getting lynched, and can't understand why Walter Lee isn't satisfied with a steady job as a chauffeur, a place to live, and a family that loves him. But like any generation, Walter Lee wants more that what his parents had, and maybe doesn't fully comprehend the sacrifices they made for him. He wants to do more than serve the white man, he wants to have something of his own, to be a respected man in the world, to give his son a better life. He feels he can't do that living in a house his mother bought, of which she is still the boss. Eventually she sees that, and puts her trust in her son; everything she has done in her life has been to give her children a good life, and eventually she realizes she needs to let them live it, even if it's different than the life she envisioned for them. The other major conflict is, of course, a racial one. Walter Lee's need to be a respected member of his family and society echos the sentiments of the modern-day Black Lives Matter movement. The white neighborhood's fear of "the other," of different people moving in and changing their neighborhood, is also a familiar conflict in today's fearful climate. Similar to Theater Latte Da's recent production of Ragtime, A Raisin in the Sun lets us view today's problems through the lens of history, and see how much things have and have not changed, and how much they still need to continue to change. At the Sunday matinee I attended, the audience was able to process their thoughts about the play through Park Square's "Musings" program, hosted by Park Square's Assistant Programming Director Jamil Jude and Twin Cities Theater Bloggers Becki (Compendium) and Gina (The Room Where It Happens), which is a wonderful way to deepen the theater experience and connect it to the world we live in. 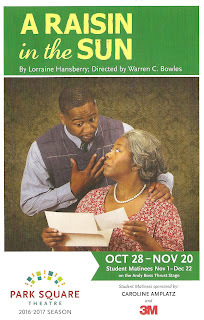 I highly recommend A Raisin in the Sun, both for adults and school groups (more details on student performances here). It's a beautifully written play that was ahead of its time and still relevant today, painting a full and rich portrait of a black family, beautifully brought to life by director Warren C. Bowles and this talented cast. Attend when there's a post-show discussion if you can, or start your own discussion. I'm writing this on the afternoon of election day, and no matter what tomorrow brings or who our president is, the work for social justice and equality continues. Theater such as this furthers that work by taking a deep look at our shared history and how it reflects in the present. A Raisin in the Sun continues through November 20, with student matinees through December 22.